Ms Okello’s struggle to the top was made at a time when “women would not even be promoted to managerial positions. Most women those days were clerks, cashiers, sweepers and tea girls!”, she said in an interview a few years ago. By the time she left the bank in 1985, Mary Okello had helped set up the Barclays Bank Women’s Association whose objective was to mentor women, equip them with knowledge and encourage them to challenge the status quo. Barclays Bank now prides itself of having the highest number of female managers in Kenya and currently has achieved gender parity on the board. The gender ratio at the board level stands at 50:50 with the employee ratio being 48:52 in favour of the men. The gender diversity at Barclays is however not reflected in most of the boardrooms and top management levels of listed companies or even state corporations. A Women in the Boardroom survey conducted by the Institute of Directors in 2015 found that banking and financial institutions had the lowest women representation (12 percent) compared to professional associations (26 percent), insurance companies (15 percent) and micro-finance institutions (26 percent). Publicly listed companies performed slightly better than banks with women representation at the board level standing at 18percentt while state-owned enterprises continued to outperform the private sector with women comprising 26 percent of the board. This is in part due to legal requirement that there should be a minimum one third gender representation in government and state corporations. The affirmative action (as represented by the two-thirds gender rule) and progressive public sector policies has been cited as a reason for Kenya taking the lead in a Where are the Women survey conducted by the African Development Bank in 12 African countries. 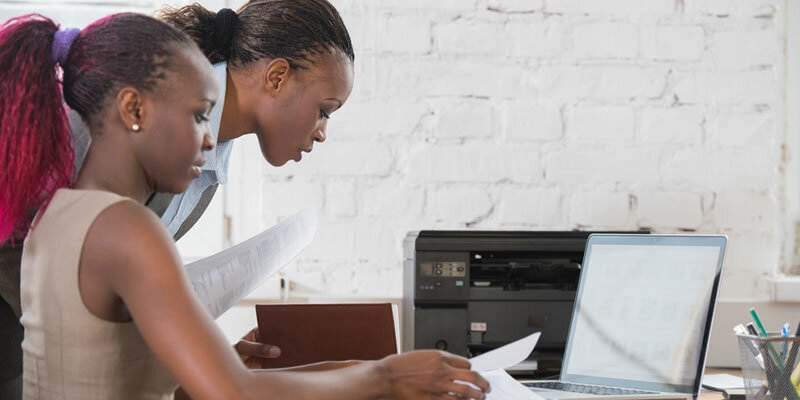 Kenya was ranked first with about 20 percent women represented in the boards of the top listed companies slightly ahead of South Africa (17.4 percent) and Botswana (16.9percentt). There is a growing body of research which shows a clear and positive correlation between increased gender diversity at top levels of corporate leadership and better company performance. The fundamental business case for more women on boards and in senior leadership positions is fast becoming undeniable: reduced risk, better decision-making, increased collaboration and broader market perspective, among many other benefits. “Women’s representation on boards is not only a gender equality issue but is also a performance optimization strategy. More and more evidence shows a better gender mix among senior management is linked with better results such as greater profitability,” Geraldine J. Fraser-Moleketi Special Envoy on Gender at the African Development Bank said in a forward to a survey looking at the number of women board of directors in the top listed companies in 12 African countries. “Plugging the leaks in the talent pipeline is clearly a top priority and there are opportunities at every transition point in it. Africa can “rise” only if both halves of our Continent have the same opportunities, and are provided with the chance to develop their talents and put them towards creating prosperity for Africa,” she suggested. The question is why with so much evidence pointing to the value of increased women’s participation on boards and in senior leadership, why aren’t there more women serving in these positions? 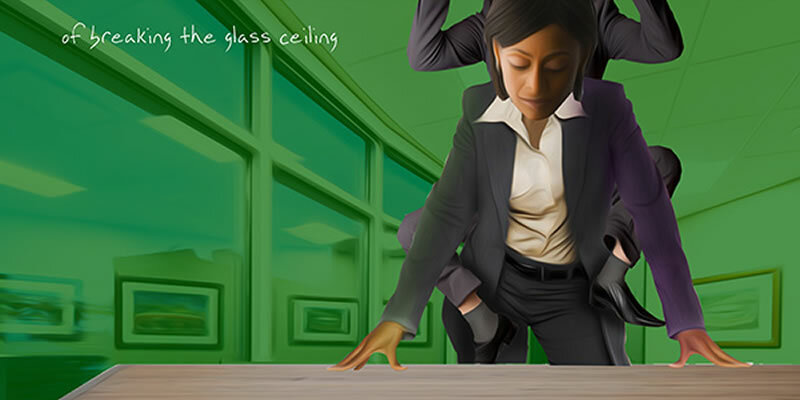 How can the women breakthrough— or at least crack— the glass ceiling? A 2017 KIM Leadership and Diversity Research survey of 52 out of the listed 62 companies revealed that women representation in the boards of listed companies had improved slightly from the 2015 outlook. The number of women board members had risen to 21 percent from 18 percent recorded during the 2015 survey by the Institute of Directors. This simply means that for every female board member, there were now four male members of the board. Of the 52 companies listed, only five had a female board chairperson, which was no different from a previous survey conducted in 2012. Women represent 7.7 percent of the board members which is favourable compared to the global average of four percent including in advanced markets like the US, Canada and Europe. At the current rate of growth, gender parity in the corporate boards might be reached by 2030. 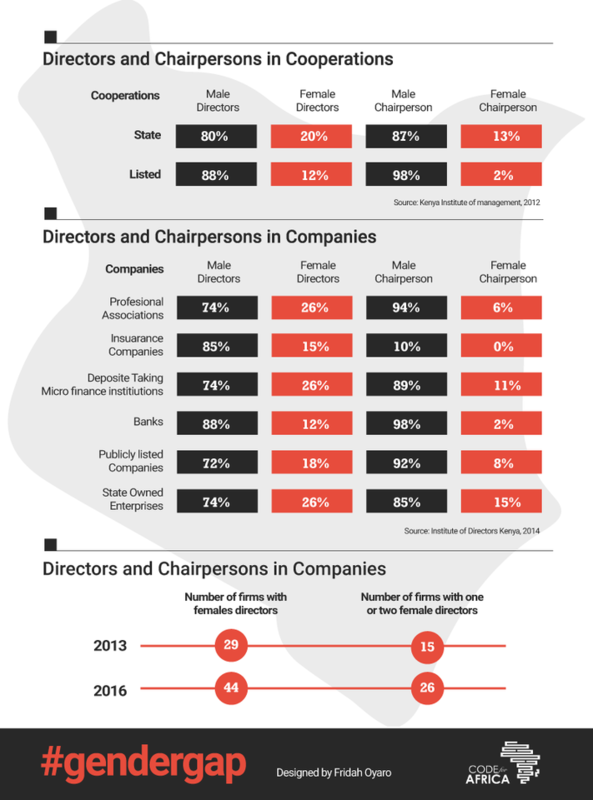 Majority of the women board members are to be found in the retail sector which however represents less than two percent of the total directors of the 52 companies that were sampled. The sectors with the lowest women representation were in Agriculture (nine percent), media (eight percent) tourism and hospitality (eight percent). Women representation on the board was also highly skewed in their favour if the company was a subsidiary or partly-owned by foreign multinationals. 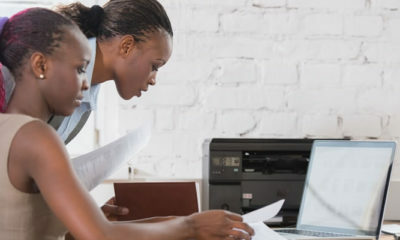 According to the survey, the average women representation on Kenyan boards is 21 percent, the representation in indigenous owned companies was 20 percent while representation in companies which were local subsidiaries of multinational or foreign-owned was 27 percent. The National Gender and Equality Commission survey released last year indicated that women serving on the boards were more likely to have a higher level of education than their male counterparts. Several recommendations have been made to encourage gender parity in the corporate boardrooms. Making it mandatory for all publicly listed companies to report on their board composition annually and whenever changes happen will encourage transparency in the appointment of members since qualifications are often brought to question when the issue of women directors is raised. This information should be made accessible to the public through the Nairobi Stock Exchange (NSE) as well as through the Capital Market Authority. The NSE should also consider including board diversity as a listing requirement for member companies similar to the Australian Stock Exchange (ASX), currently considered the ‘gold standard’ on what Stock Exchanges can do to advance women into board directors’ position. The ASX was the first in the world to institute gender diversity on boards as a listing requirement, which means that member companies must report annually on the percentage of women on boards, in senior management and in their overall workforce. Dianarose is a member of the Wanadata initiative, a network of women data journalists in Kenya led by CodeforAfrica. 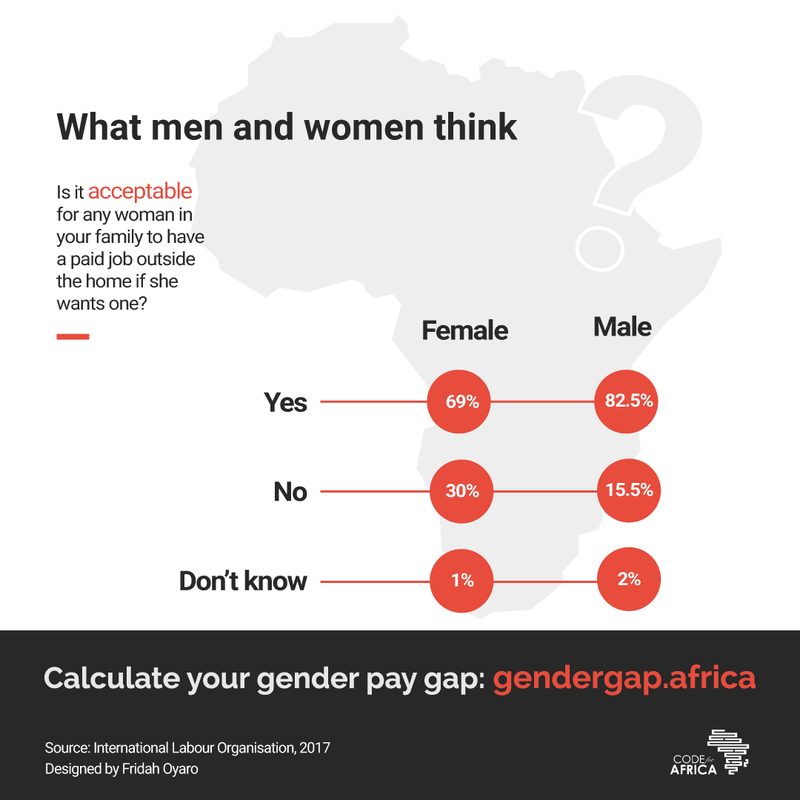 Seven years after the promulgation of the 2010 constitution which forbids gender discrimination, Kenyan women are still not receiving equal pay for equal work done. They are also being short-changed when it comes to getting equal pay for work of equal value. That means they have less spending power, have less to save and even less to put aside for their retirement meaning that many are in later life forced to be dependent on their families. According to the World Economic Forum report 2017, a Kenyan woman is paid Sh55 for every Sh100 paid to a man for doing a similar job. 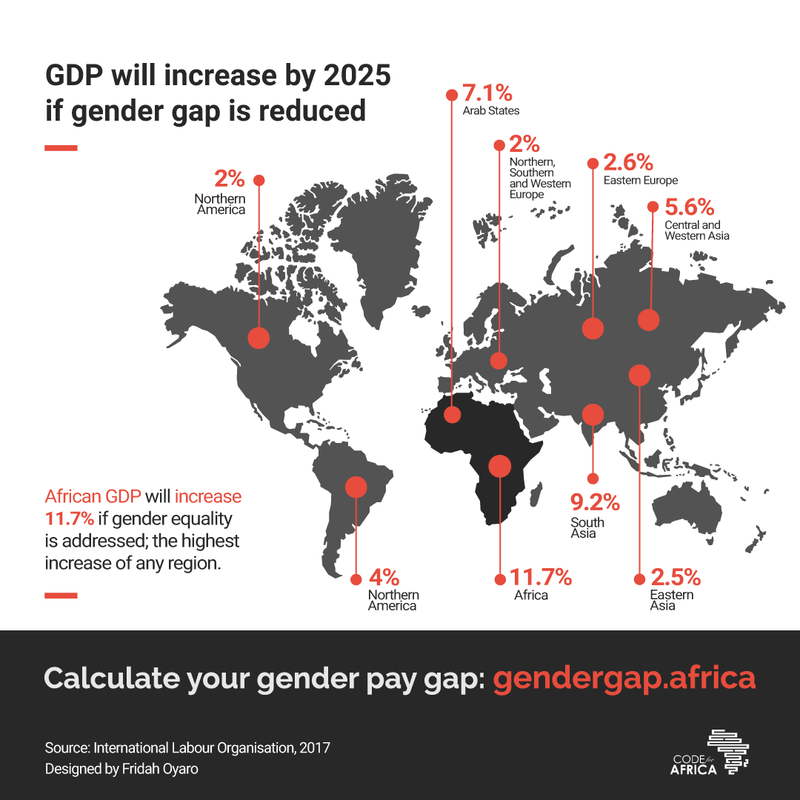 The Human Development for Everyone report released in March 2017 and compiled on the basis of estimates for 2015 indicated that women make up 62.1 percent of the total labour force compared to 72.1 percent of the men surveyed during the same period. 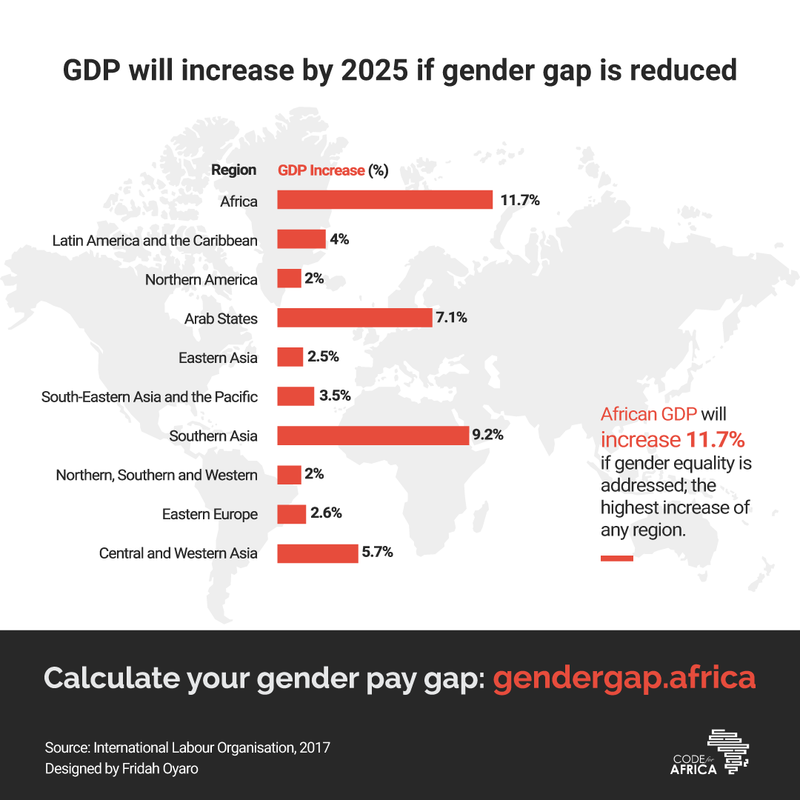 The same report indicated that while Kenyan men earned an estimated gross national income (GNI) per capita for males of $3,405 (Sh350,715) in 2015, this was far higher when compared to the $2,357 (Sh242,771) for females. The GNI per capita reflects the average income of a country’s citizens in dollar terms. And because they earn less than men and are less likely to control land, women pay less in taxes and are less likely to be leading in entrepreneurial activities. So, why do women continue to earn less than men? 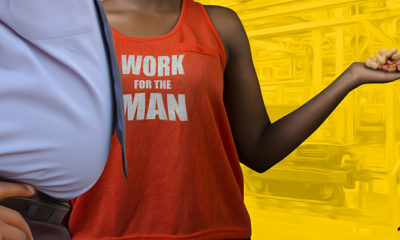 The Learning and Development Manager at NEST – a multidisciplinary group working with film, fashion, visual arts and music – Dr Njoki Ngumi says the general lower value ascribed to women translates everywhere, especially in the formal workplace. Dr Ngumi also heads the HEVA Fund, which invests in the transformative social and economic potential of the creative economy sector in the East African region. “This (the formal workplace) continues to be a site for consolidating power, building wealth and amassing influence outside the home and we have been socialised to see women as not needing this access as they are supposed to be catered to by the resources of men in their lives,” said Dr Ngumi. One of the biggest hindrance to equity in pay can be attributed to women having to take time away from work to have babies or what has been described as the ‘child penalty’ (the percentage by which women’s pay falls behind men as they start bearing children.) A study by the National Bureau of Economic Research on Children and Gender Inequality conducted in Denmark and released in January 2018 indicated that having children creates a gender gap in earnings of around 20 percent in the long run. This gap is driven in roughly equal proportions by labour force participation, hours of work, and wage rates. The study showed that while earnings did reduce with men after having the first child, the drop in earnings for women was steeper and more visible. While similar studies have not been conducted in Kenya, motherhood has a direct impact on women’s earnings. Working mothers experience systematic disadvantages in pay, perceived competence, and benefits relative to childless women. Few companies are yet to provide breastfeeding stations for nursing mothers or make their workplaces “mother and baby friendly as stipulated in the Breastfeeding Mothers Act which was enacted by Parliament in June 2017. 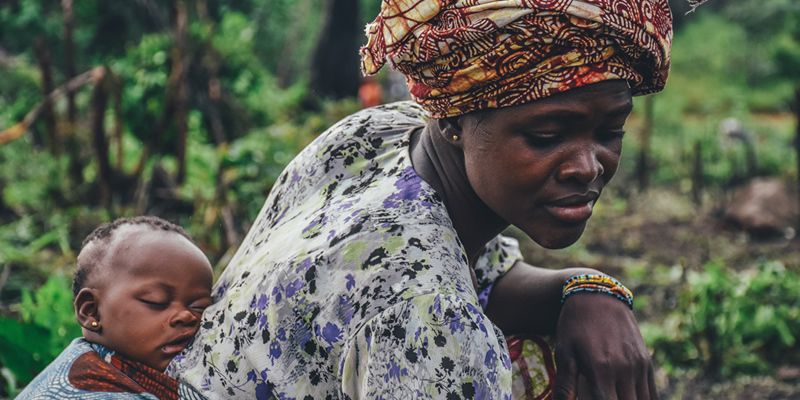 In Kenya, as in most developing countries, the value placed on women’s labour such as nurturing and being supportive of their families and children are not regarded as having a high economic value. Women have to take time out to attend to these ‘undervalued’ activities, thus a perception that they are being less loyal to the company and are more likely to exit the workplace in their childbearing years or be given less opportunities to advance to roles with greater corporate responsibilities. Even though this may not be true in some cases ambition in women is particularly pathologized, notes Dr Ngumi and as such employers almost tend to see it as their duty to ensure that women will be available for home duties, while assuming that men have no such duties. Even in instances where women are qualified, Dr Ngumi observes that women tend to be hired for ‘emotional labour’ which then makes the workplace ‘happier’ and since this is not skills based but rather based on women’s ‘innate characteristics’ they are subsequently paid less. While part-time work may not amount to much wage difference per hour worked it, however, always results in the woman bringing home less money by the end of the month. Many women with young children may opt to take up temporary jobs or those that offer them more flexible working arrangements and as a result, end up missing out on earnings growth associated with staying in a permanent job. They may also opt to work for smaller companies which are more amenable to giving them flexible working hours instead of big companies where opportunities for career growth may be more and salaries may be higher. Part-time employment refers to regular employment in which working time is substantially less than normal. “I think that the pay gap is such an entrenched concept that flexitime- which is still more an exception than a rule – does not contribute as much to the pay gap as we think,” she said. For Dr Ngumi the real issue being that in general the workspace has not had time to get into the true understanding of delivering on deadlines from home without the supervision of a senior, and the assumption is that remote work for middle cadres and people with more tangible deliverables is not real work. She said the freelance economy – while offering varied freedom like time – also creates a space that denies the worker the benefits of a full umbrella of cover by an employer, or the safety controls of a formalised work structure. All these combine to disadvantage women with small children further. 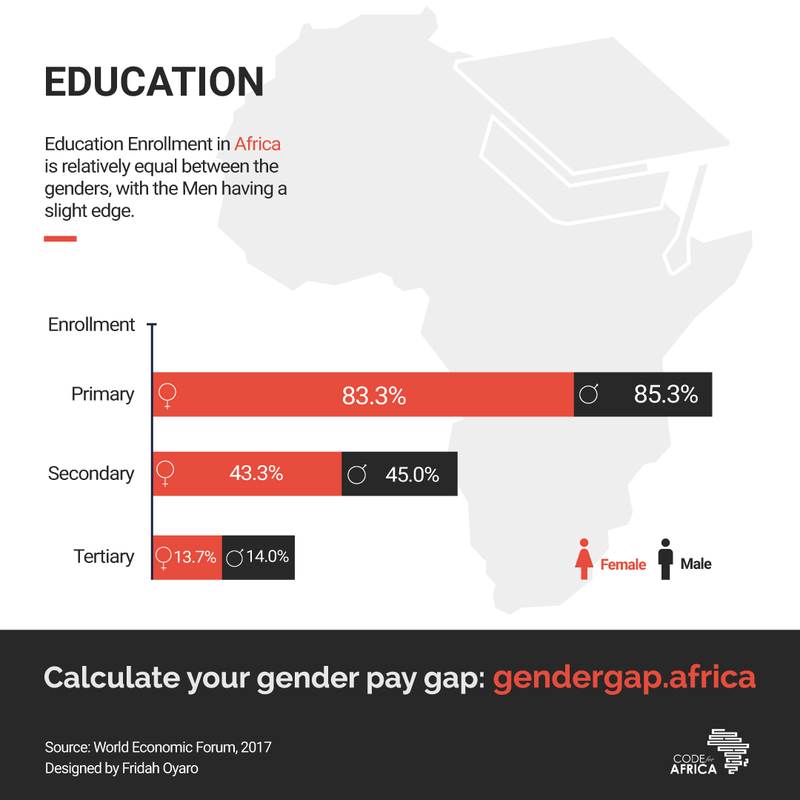 Education plays a major role in the gender pay gap with women more likely to get an average of about 11 years of schooling compared to men – 11.4 years. While at the primary entry level the gap between boys and girls is negligible, this becomes wider due to early marriages and other cultural biases which tend to favour boys over girls. “Gendered games we introduce to children in early childhood illustrate the roles we see men and women playing in society. Boys are encouraged to build new, imaginative things and go on adventures, while girls are encouraged to arrange things neatly doing domesticated tasks and aspire towards being beautiful and dressing well,” said Dr Ngumi. In Kenya, every person, including women, have the right to fair remuneration. Women and men have the right to equal treatment, including the right to equal opportunities in political, economic, cultural and social spheres. What can be done to reduce the gender pay gap? Companies or branches of industry should publicise the wages/salary scales to make it easier to highlight unmerited wage differences. According to Dr Ngumi, employers should provide on-the-job training or work-related upgrading courses specifically to cater for their women employees and introduce mandatory quotas for each gender in the non-executive boards of listed companies and state parastatals. Implementation of the two-thirds gender quota clause in the constitution. The election of 23 women in the National Parliament during the 2017 election was a slight improvement from the 16 elected in 2013. This might be an uphill task as there is clearly no political will to implement this as can be seen from President Uhuru Kenyatta’s Cabinet appointments. The government should enact policies and Parliament enact laws that would make it easier for women to not only own and inherit land but also enable those who own land to access credit. Editor’s note: A previous version of this piece had attributed a quote to Dr Njoki Ngumi. The quote was misplaced and The Elephant has taken the earliest opportunity to correct this. Joyce Kajuju, 51, was born in Meru County. She is the fifth born in a polygamous family of eight siblings. Her father married two wives, Kajuju’s mother being the first wife with four daughters, while the second wife gave birth to three sons and one daughter. Growing up, Kajuju never knew that being girls only from their mother’s side was at their disadvantage with regards to land inheritance. When her father decided to divide their land, Kajuju’s mother was never considered. This is because she was not blessed with sons, who would thereafter inherit her land when she dies. “When my father divided the land in early 2007, his second family took everything from my mother, including all her farm produce such as the banana and fruit trees she had planted. They went ahead and warned her not to use anything from that land. She was just left with her house,” Kajuju – a mother of three; two sons and a daughter – narrated to The Elephant. Kajuju’s father adamantly refused to allocate his first wife any land. Her father’s response prompted Kajuju and her three sisters to act by taking the matter to the land tribunal in the same year. The tribunal ordered Kajuju’s father to allocate a small portion of land to their mother, as she was one of his wives. On their return home from the tribunal, her father and her stepbrothers refused to honour the ruling. Kajuju decided to pursue the matter and file a case in court, determined to see her mother get justice. Even then, her father and her step-siblings refused to obey the court order which ruled that Kajuju’s mother had to have a share of the family land. Kajuju pursued the matter to the high court which ordered her father to allocate at least half an acre out of the family’s five and a half acres of land to Kajuju’s mother. Kajuju’s father and her stepbrothers defied the High Court order forcing Kajuju to file an appeal. The appeal was successful and in 2015, Kajuju’s father and her step-brothers reluctantly agreed to give up the half acre. It was a bitter-sweet victory for Kajuju and her sisters as their mother had died in 2009, four years after their father had refused to recognise their right to a share of the family land. For eight years, Kajuju and her sisters were in and out of court, fighting hard, to ensure that they and their mother – even though late – got justice. But even after Kajuju and her sisters got the half-acre, they had to contend with the harassment and intimidation from their step-brothers and other relatives who were angry that ‘mere girls’ had been allocated land! When Kajuju’s father died in September 2017, their step-brothers refused to bury him on his land claiming that it was too small to accommodate his grave. To avoid unnecessary fights, Kajuju and her sisters opted to bury their father in the half-acre piece of land that had been allocated to them. They sub-divided the rest of the land among the four of them and are now using it for subsistence farming. Despite successfully suing to get a share of the family land, Kajuju and her sisters face numerous obstacles. They are treated like pariahs in their own home by their family and the local community, who cannot understand why they took their father to court yet they were married. “What are they coming back to look for from their father?” a question Kajuju and her sisters dealt with throughout the eight years they were in and out of court. Three years later, Kajuju and her sisters still live with the consequences of their action. 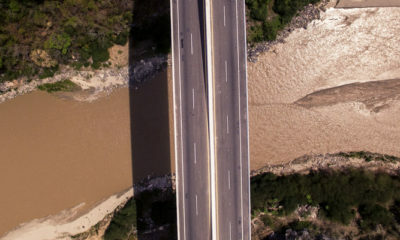 Local water officials who are laying out pipes to connect farms in the area to water have refused to extend the same services to Kajuju and her sisters, even though the main water pipe passes right on the boundary of their small farm. “They tell us that we didn’t do the right thing by pursuing justice for our mother. It is like they are punishing us for doing that. We are treated like outcasts. Our stepmother does not even talk to us!” Kajuju adds. But Kajuju and her sisters are a lucky lot as they were able to challenge these traditions without the violence and other forms of aggression meted out against other women who have dared to fight for their rights to inherit land as daughters or spouses. She and her sisters also had the financial resources to file and pursue the court case to its logical conclusion. They spent in excess of Sh100,000 in legal fees not including the time spent. The high legal costs also present a major hindrance to women fighting for land and property rights. At the time Kajuju and her sisters were fighting for justice for their mother, the 2010 constitution had not been promulgated. Kajuju and her sisters were made to jump through numerous hoops, endure untold delays and overcome intimidation and harassment from their step-siblings before they succeeded in getting a share of their father’s land. A seminar organised by the Kenya Land Alliance on Women Land & Property Rights attended by Kajuju, enabled her to learn more about the laws governing land ownership. 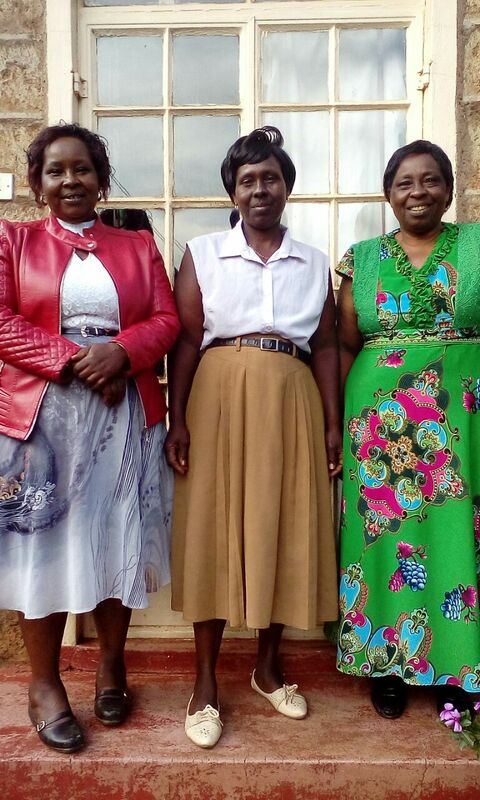 Kajuju (left) with her sisters Ann Peter (middle) and Jane Muriithi (right). Even though Kenya has a progressive legal framework, women’s land rights continue to lag behind those of men. Customary law, such as the one applied by Kajuju’s father and practised by the Ameru community, often discriminates against women and limits their land and property rights. The patriarchal nature of Kenyan society often limits the rights of even those women not living on land governed by customary law. In Kenya, as in many other developing countries, land is a critical asset, especially for the urban and rural poor. Land rights—whether customary or formal—act as a form of economic access to key markets. Rights to land also confer women rights to other local natural resources, such as trees, pasture, and water. An improvement in women’s independent property rights accords women greater control over agricultural income, gain higher shares of business and labor market earnings, and more frequently receive credit. Land ownership is extremely critical for women who became the de facto heads of households due to divorce, death, abandonment or out of choice. In both urban and rural settings, independent real property rights under these circumstances can mean the difference between having to depend on the husband’s family for support and forming a viable, self-reliant, women-headed household. Women’s land rights within marriage may afford them greater claims on the disposition of assets upon divorce or death of their husband. In the absence of formal social security, elderly rural populations rely heavily on intergenerational transfers for their livelihoods. Children are more likely to contribute to their parents’ well-being if the latter retain control over a key productive resource such as land. But this is is not always the case. For example, the motive behind the rash of murders of elderly men and women in Kilifi and Kisii is more to dispossess them of the land that claims of witchcraft. Cases where male relatives have sued their mothers and sisters to bar them from inheriting family land and other property have become increasingly common. While legislation in Kenya is generally positive toward women’s land rights, the judiciary exerts only a weak presence beyond major urban areas. The state lacks or is unwilling to commit resources to advocating, promoting, enforcing, and protecting women’s rights to land and property. State institutions such as the National Land Commission are inadequately resourced or committed to enforcing equal rights for women as well as other laws, such as land use laws, local customary norms and practices predominate. There has been resistance from program implementers which results in token observance of women’s legal land rights. The implementation of the titling program resulted in the great majority of the land being titled to men. “We have so many instruments that talk so good about issues on women land rights, but the implementation is what is lacking. There’s still a lot to be done,” says Naomi Lanol. In some parts of the country where land ownership rights are often vested in a community or lineage or clan, women have little access to the land. Community ownership of land is where control is vested in a group and not an individual and is managed according to community rules. Households are allocated land through a customary system on a long-term basis to produce food, build a home, or raise animals. The right to these parcels of land are generally inheritable. However, even in such communities e.g. the Masai, the Samburu, and other pastoralists communities from the North Eastern region in Kenya, married women are not full and active participants in customary institutions. Their rights to land are generally derived from a male relative or husband. As such, they can only access land through their relationship with a male relative, such as a father, husband, brother, or even brother-in-law. Even though some customary tenure systems provide women with some basic security in situations when they are not living with a husband, this same system also favors men when control over land is determined. Because the men in the community usually control land allocation, they are able to claim individual rights when land scarcity converts the land into an asset and when family land becomes private property. In Kenya, for example, the subdivision of Maasai group ranches caused widows to receive less-than-average parcel allocations, even through the women were represented in the statutory committee. Women may not only lose the use rights to their husband’s land but will also most likely be unable to claim temporary use rights to birth family land because their brothers will claim individual and private rights to the land they inherit from their fathers. The most common inheritance practice in Kenya is patrilineal (where land is handed down from mother to son and if the man does not have any sons, his brother, nephew or another male relative of his lineage can inherit.) Under this practise daughters do not inherit land from their fathers, even though they are of the same lineage. The cultural norm is that daughters leave their birth community and family when they marry to live in their husband’s community. Because wives are under the responsibility of their husband and family, it is believed that if they inherited land, their husband’s family and lineage would obtain control over it. Matrilineal land inheritance is where property can only pass along the female line, most commonly going to the sister’s sons of the decedent; but also, in some societies, from the mother to her daughters. Matrilineal land inheritance is rare and even in communities where social continuity is expressed through concepts of matrilineal kinship or matriclans, there are gendered relations in land ownership. Before conversion to Islam, colonialism and the emergence of the independent state the rules of inheritance in practice were negotiable and flexible in Digo society. Children inherited from male and female maternal relations as well as their matriclans, but not usually from their father. Muslim inheritance norms are bilateral, recognizing daughters’ rights to family property (albeit a fraction of the share their brothers inherit). Where the customary tenure system is strongly patrilineal, however, Muslim norms may be ignored and strictly patrilineal inheritance practised. Among some Muslim communities like the Somali, for example, only sons can inherit from their birth family while daughters are at most, given temporary use of their father’s land in the event they leave their husband due to widowhood, divorce, or separation. Single daughters with children also have temporary use rights. In some parts of the country where land ownership rights are often vested in a community or other corporate structure such as a lineage or clan, women have little access to land. This community ownership of land is where control is vested in a group and not an individual and is managed according to community rules. Households are allocated land through a customary system on a long-term basis to produce food, build a home, or raise animals. The right to these parcels of land are generally inheritable. In such communities e.g. the Digo, the Masai, the Samburu et.c. married women are not full and active participants in customary institutions. Their rights to land are generally derived from a male relative or husband. They can only access land through their relationship with a man relative, such as a father, husband, brother, or even brother-in-law. Even though some customary tenure systems provide women with some basic security in situations when they are not living with a husband, this same system also favors men when control over land is determined. Inheritance practices are patrilineal, matrilineal, or bilateral. In patrilineal inheritance, land is generally handed down from father to son; if a man does not have any sons, his brother, nephew, or another man relative of his lineage often inherit his property. Daughters do not inherit land from their fathers, even though they are of the same lineage. The cultural norm is that daughters leave their birth community and family when they marry to live in their husband’s community. Because wives are under the responsibility of their husband and family, it is believed that if they inherited land, their husband’s family and lineage would obtain control over it. Such cultural beliefs have been cited as major hindrances to the enjoyment of women’s land and property rights in Kenya according to a Women’s Lands Rights report by the Federation of Women Lawyers (FIDA). Male inheritance of land is predicated on the notion that sons remain within their families while daughters get married and leave. These patriarchal traditions and sexist attitudes where men perceive women to be “untrustworthy, and incapable of handling property” has infused Kenya society to the point where, under the pretext of offering women ‘protection’ the women are stripped of their rights to land and property. In many instances, women are not allowed to inherit their husband’s land and risk disinheritance on the death of their husbands. Others have no option but to accept being re-married by their deceased husband’s brother or close relative in order to remain on the marital land. Marriage practices including where the couple lives after marriage and asset transfers (dowry) also determine how family land is allocated and who has rights to family land. In most patrilineal societies, where the couple and their children live in the husband’s family, family land is handed down from father to son. Therefore, women who marry into the community do not have rights to their husband’s family land or community land. Separated and divorced women leave their husband’s house with no claim to any of his property. A widow, particularly if she has children, is generally permitted to stay on and work on her dead husband’s land until her sons can assume its management. In an article published in 2015, lawyer Pravin Bowry cited several anomalies that exist in the Marriage Act, the Matrimonial Properties Act and the succession Acts which he said were discriminatory. Among the anomalies he cited were the rights of women in come-we-stay relationships to inherit their partners land and property in the event of death. These anomalies have been at the root of numerous raging court battles which invariably such deaths. The laws of intestacy (where one dies without making a will ) and the entitlements provided under the laws of succession are applicable in all areas except West Pokot, Turkana, Marsabit, Samburu, Isiolo, Mandera ,Wajir, Garissa, Tana River, Lamu, Kajiado and Narok. It is not clear why this distinction is made as it is in contradiction to Article 27 (1) of the Constitution, which provides for equal protection and benefit of the law. As inherited family land becomes scarce, and communities are no longer able to allocate land to new households, couples are more apt to purchase land. In those customary societies in which women and men both own land, joint ownership of marital property is more likely to be practiced. For example, in some communities in Kenya, where sons and daughters inherit family land, it is customary to regard land acquired during marriage as belonging to both husband and wife. If one spouse dies, half of the property remains with the surviving spouse while the other half is inherited by their children. Without data, it is difficult to confirm just how much land Kenyan women own. 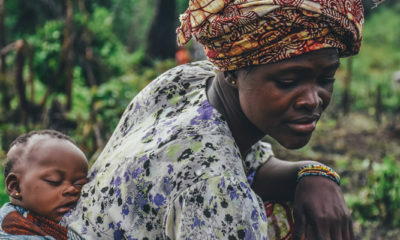 This lack of adequate data has led to numerous generalised claims about women and land ownership such as “less than 2 percent of the world’s land is owned by women” or “women own approximately 15 percent of agricultural landholdings in Africa. Such claims while shocking, fail to provide governments and advocacy groups with information that would help in policy formulation and programme implementation that would reduce the inequalities faced by women in accessing and owning land. The Ministry of Lands is considering putting in a request for this kind of data to be collected during the census scheduled to be held next year. “We shall use whichever means at our disposal to try and get this data. When we register titles, we do not ask for gender. This is something we hope to change because such data is important for informing policy and decision making. How can we intervene to encourage more women land ownership if we do not have this basic information?” says Lands Cabinet Secretary, Farida Karoney.